I have created user group Group-1 in SharePoint Online Site. I have added few members in Group-1. Now, I have created a group Group-2 in Office 365 and added few members in the Group-2. Now I have added this Group-2 in SharePoint Site. Now when I am trying to get the Groups and Members of SharePoint Site then I am getting only Groups created in SharePoint, but I am not getting the group created in Office 365 and associated in SharePoint. Note: I am able to see that Group-2 in SharePoint using GUI but not members. How can I get the Group-2 and its Members in SharePoint programmatically? Let me know if there is need of more details. you can get the user from that specific group using rest api as below. Did you create an O365 group in Office 365 Admin Center directly? If yes, you need to add members to the Group-2 in SharePoint site manually. In That case it should added to any other group as a member. 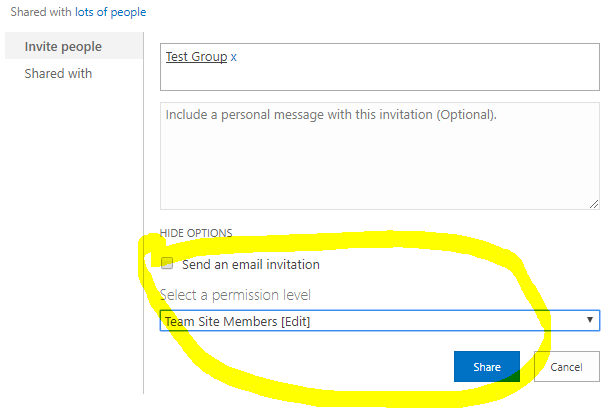 as in given screen shot I have shared site with "Test Group" which is office 365 group and it is added to Member Group of sharepoint site group. Not the answer you're looking for? Browse other questions tagged sharepoint-online user office-365-groups or ask your own question.